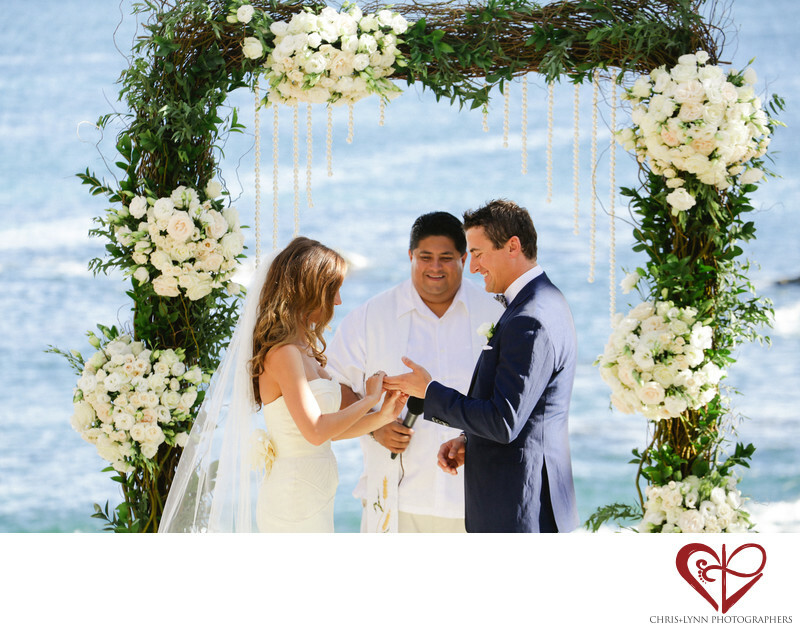 After the bride and groom finish exchanging their vows, the next step is the exchange of rings! The reverend smiles as the bride slips the ring that she picked out for her husband, custom made by Geengee, onto her groom’s ring finger. Behind them, the light blue ocean sparkles under the reflection of the sun. The beautiful cream and light pink roses on the ceremony arch look beautiful when the light falls on them, thanks to florist Elena Damy. After spending so much time picking out the perfect rings for each other, the bride and groom finally get to slide the beautiful silver bands onto each other’s fingers. These lovebirds will keep this rings on for many more years to come, so this is an important moment to document. We love the way the natural light casts a glow on the bride and gloom at this time of day. 1/100; f/5.6; ISO 100; 176.0 mm.